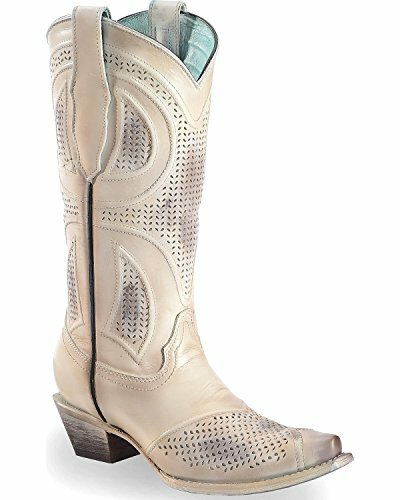 CORRAL Women's Laser Cut Wedding Boot Snip Toe Beige/Khaki 6.5 M by CORRAL at SCRHI. MPN: C3138. Hurry! Limited time offer. Offer valid only while supplies last. These Corral Women's Laser Cut Snip Toe Wedding Boots would look amazing on any bride. These boots have a rustic look, perfect for a western wedding. These Corral Women's Laser Cut Snip Toe Wedding Boots would look amazing on any bride. These boots have a rustic look, perfect for a western wedding. Not only for brides, they would also look amazing with a great pair of jeans and your favorite top. Get yourself a pair for your big day, or any day where western apparel will do.